Fred Mitchell, Chicago Tribune writer and author of many sports books, made this comment about Loosey-Goosey Baseball, a children’s book written by former MLB pitcher Steve Trout and high school English teacher Marlene Matthias. 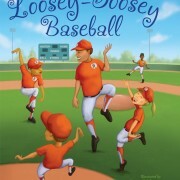 Trout and Matthias recently published Loosey-Goosey Baseball, which illustrates how a coach handles an overbearing parent and teaches his players to overcome anxiety that is caused by their parents’ actions and by the fears associated with playing baseball. With over two million Little League baseball and softball players, many players and parents have witnessed overbearing parents at games and kids dealing with anxiety. Like Mitchell’s comment about Loosey-Goosey Baseball appealing to both children and parents, adults who have read the book suggest that fathers and mothers read it. To address the issue of kids dealing with anxiety in sports, Trout and Matthias are conducting author visits at sports banquets, schools, Boys & Girls Clubs, and day care centers.